John Thomas Nutton was the son of John Thomas Nutton and Minnie Flora Beckham. He had a full brother William Nutton and a half sister Minnie Flora Jackson. John's parents had married in 1892. John Sr passed away in 1897, his mother remarried to William Walter Jackson in 1898. John T Nutton lived with his mother, brother, stepfather and half sister at The Victoria Hotel, Marine Parade, Sheerness at the time of the 1901 Census. His stepfather was the publican. John was married in 1916 to Clara Mary Shergold. Together they had three children, Clarice Mary born in 1922, Adrienne Minnie born in 1924 and a son John known as "Jack". John was enlisted with the navy and was an Officer's steward, 1st class. John was playing the part of the "Auntie" in the demonstration. He was said to have been one of the victims who jumped from the burning structure, his costume in flames. His brother William who was present at the fete said that he had seen his brother at the top of the dummy house when the fire started. Following the fire John was rushed to the Naval Hospital and was able to speak to his brother William. Describing his brother's death in hospital William said "He made no sort of statement about the fire. He only talked of his wife and children." William would identify his brother's body. The attending doctor, Surgeon commander Robert James said that John was admitted at 10:30 on the Thursday eveing suffering from extensive burns on his face, scalp, neck, both forearms, hands, the small of the back and both legs and feet. He had a fracture dislocation of his left wrist cause from his jump from the structure. He passed away at 11:35 am the following day from shock resulting from his injuries. He never spoke of the tragedy. John was a well like and respected part of the community. He was popular at local events. His clowning has aided many local charities for which he was well known. A photographer in Gillingham was said to have selling photographs of John in his costume as "Auntie". They were sold at sixpence each, four pence which went to his widow. John's coffin was carried by a gun carriage to the cemetery. Because of his service John was entitle to a plot in the Naval section of the Woodlands Cemetery. John's son, John A W Nutton, was born in 1919 and was the village milkman in Charing, Kent He was widowed after having two children, Ian & Angela. He eventually remarried. John passed away in 2008. Clara, John T Nutton's widow, lived with her daughter Adrienne from the date of her marriage in 1946 to Douglas Jackson, through to 1968. She decided at that time, at the age of seventy five that she'd like her own flat (the first time in her life she'd lived alone). Clara passed away in 1974, age 81. Adrienne passed away in 2008. Clarice married John Ellson and had three children. She passed away in 1988. The grave of John Nutton with flowers placed by his family members during the July 10 2011 Commemoration Service. 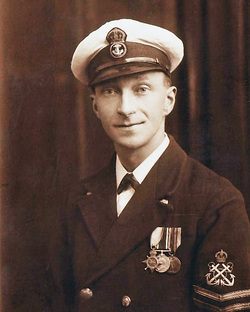 John was entitled to a Naval plot because of his service.